"The Bourne Ultimatum," starring Matt Damon, opened to an estimated $70.2 million in the U.S. and Canada -- a record for a movie launched in August, and one of the best starts ever for an action film. Some things you wish you could forget. (Like Firewall.) All Jason Bourne wants to do is remember -- and your $12 movie ticket will help jog his memory. 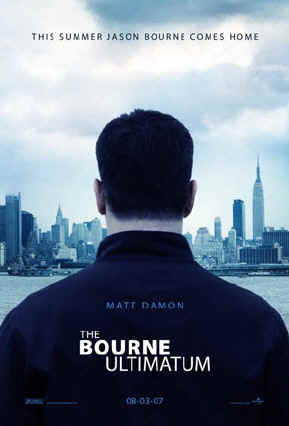 Matt Damon returns in The Bourne Ultimatum, based loosely on the late Robert Ludlum's trilogy of novels. Jason Bourne is an unwilling lethal weapon -- a man with no past seeking the people who made him the killing machine he is. (If you've seen X-Men 2, you can skip this film. WHAT? Maybe if you're dead, but even then you should at least throw it onto your Netflix queue -- if that search-for-identity plotline was resolvable by watching just one movie, Hollywood as we know it would not exist. And in case I don't make this clear later on: I. Loved. This. Movie. Not just in the sour nice-timing-with-the-FISA-wiretap-reapproval sense, either, though I was certainly thinking throughout the movie about the House's vote to extend warrantless surveillance for a while. (More on the duration of such programs anon.) If you loved last year's reinvigorated James Bond in Casino Royale -- a direct descendant of the Bourne trilogy's emphasis on reasonably plausible tech and real action rather than wacky made-up gadgetry and numbing CGI -- you're going to dig this movie. Bourne begins his quest by interrogating a British journalist to whom a former government agent has spilled the beans on Blackbriar -- the new-generation version of Treadstone, the black-ops project that created and employed Bourne. But when a story that big breaks, you can bet Bourne isn't the only one who wants to know the reporter's source. 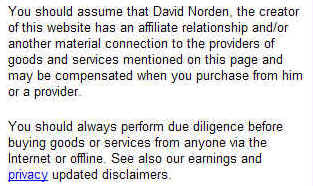 Unfortunately for Bourne, the next head on Blackbriar's chopping block is his. Can he discover his secret identity before it's too late? What my colleague doesn't mention here is the chewy tech goodness in play from the drop -- again, working in the realm of the real for maximum geek enjoyment. The Echelon program's international wiretap and phrase extraction capabilities are a major plot point (and, yes, they call it Echelon -- I thought of Duncan Campbell's years of work at uncovering that program, even as I wondered if the reporter played by Paddy Considine is meant to be a Campbell nod). The list continues. London's ubiquitous surveillance cameras are spotlighted exceedingly well; a prepaid mobile phone grants a limited but crucial privacy smokescreen; a dual-authentication biometric key makes a showy appearance; a Norton antimalware program slows down a character's laptop. A few moments are a little offputting -- Hollywood will weird out with the on-screen graphics, I fear -- but one of the cardinal beauties of the Bourne trilogy is that the tech is pretty plausible, even if the realm of "plausible" has greatly expanded in the era of Google Earth and such. In fact, I made a few notes re: Everything I Needed to Know About Enterprise Security I Learned From Jason Bourne (or EINTKAESILFJB) -- more on that in a bit. For now, though, I will note that not only is Jason Bourne a genius of lateral thinking and probably more up-to-date on current surveillance technology than half the people in your office, but the Waterloo station scene -- in which he directs another character's movement via mobile phone, correcting for missteps on the fly -- makes him my candidate for Best GPS Device Ever. Someone please have Matt Damon installed in my car immediately. Thank you. Let us continue. Don't worry about those bad guys staying down, though: The Bourne Ultimatum's body count is down 75% from the previous film. And despite some wild car chases, there are no truly stand-out fisticuffs. Huh? I didn't breathe for the duration of the Tangiers sequence. Sure, we like to see Bourne exemplify his supremacy with some utter smackdowns, but he doesn't defeat his more capable foes with anything too original or creative. Dude, I'm serious -- are you sure you weren't watching the Harry Potter movie next door? And there's a EINTKAESILFJB teaching moment right there: Good security is less about mass gadgetry and more about brains and smart deployment. In the first film, Bourne proved the pen is mightier than the sword; in the second, a rolled-up magazine was the weapon du jour. It's a gimmick I've come to expect of Jason Bourne (and Jackie Chan), and I was disappointed to find no such equivalent scene in this installment. !!! A BOOK! HE KILLS A GUY WITH A FLIPPIN' BOOK! And not some rolled-up O'Reilly text, either -- though I can't imagine anything that would've pleased the nerds in the audience more. Brother Jason rolls with HARDCOVER! OLD SCHOOL! The progression itself was a nice little nod to the film's trilogy status -- pen, magazine, book. I don't even know how you follow that up. Maybe in the fourth film of the trilogy -- if Douglas Adams can do it, why not -- I say he lobotomizes a guy with a BlackBerry? BlackBerry right through the frontal lobe. I am so there. EINTKAESILFJB moment: The Web is nice, but don't be shy about keeping a few good hefty reference books near to hand. Of course, Bourne faces more than hired goons, and films such as this can't get away with much when it comes to IT. Live Free or Die Hard was allowed creative license because the technology created absurdly demanding situations for Bruce Willis to physically overcome or, putting it another way, because that audience tends to be less about the thought and more about the spectacle. IT was just the means to that end. Or, rather, HollywoodIT. So very different -- one is reality-based, and the other... is from Hollywood. The rest of the film's tech is primarily of the surveillance genre: wiretaps, GPS tracking, even gunmen with camera phones, giving some scenes the feeling of a first-person shooter video game. Or, you know, Friday afternoon's headlines. There's nothing along the lines of the more entertaining cell-phone-SIM-duplication we were treated to previously; instead, we watch Bourne do a Web search. I want that zooming monocular thing that he trains on CIA headquarters. There was a lot of nice tech around the edges, but even I didn't want to see this become a gadgetfest. With the exception of the point where I started shifting around mumbling about uploading to YouTube/BitTorrent -- more on that in a second -- I was comfortable with the tech shown. The most daring infiltration of the film -- that of CIA headquarters itself -- we're not even witness to, leaving much to the imagination. Perhaps that's for the best, as if the film had gone on any longer, I would've had to reach for the airsickness bag. As with The Bourne Supremacy, this film is directed by Paul Greengrass, author of Spycatcher that's the M15 tell-all that garnered such notoriety in the late 1980s; for some of us, it was the first real-life spy book we ever read and director of United 93 another film about effective use of low-end technology -- think about it. He employs in this film the same shaky camera style that I found so nauseating in his other works. A cameraman's job should be to frame a shot and focus the audience on a particular object or action. Greengrass' style is to make his crew look as bewildered as the audience feels, constantly panning and refocusing as they try to find the action in a scene. A couple can't even sit down for coffee without constantly bobbing and weaving! Rather than drinking in the cinematography or choreography, your eyes will be working hard just to discern what's going on. We're out of the security realm here, but purely as an audience member I'm going to disagree -- the camerawork was kinetic and exciting, and based on the amount of popcorn I put away during the movie, not at all nausea-inducing. I particularly liked the disorientation effect during Julia Stiles' chase segments, where the effect reminded me that the same stuff that Matt Damon made look easy or at least nonfatal for 2.5 films at that point really... isn't. It's a shame, since the talented cast deserves to be seen. David Strathairn, who earned himself some serious security-geek cred in Sneakers [yes, we love us some Whistler], plays the single-minded deputy CIA director with a simmering malevolence. Likewise, I'll never cease to be amazed by Julia Stiles. Granted, she doesn't actually do much in this film, other than look very serious and pouty. But she's a breath of fresh air as the youngest person on the set, while still not being the silly git she seemed destined to become after films like 10 Things I Hate About You. EINTKAESILFJB moment: Listen to your users, as Stiles' Nicky Parsons and Joan Allen's Pamela Landy do, and you just might learn not only what they did but what they were trying to do -- useful data for predicting what they might do subsequently. Allen returns as agent Landy, who emerged at the end of Supremacy as the moral center of Bourne's world post-Marie (who, though only seen in flashbacks, gets a nice visual reference late in the film -- Matt Damon's reaction to the moment reminds us again that he really is that good at keeping this character understated but absolutely on emotional track, and with precious little dialogue with which to work). Allen has the most low-tech moment of the film, the one that had me wishing someone had heard of peer-to-peer for classified document dissemination -- hey, why not? the rest of the government's doing it. And she's the other party to the most gut-twisting, ripped-from-the-headlines exchange of the film, in which Strathairn's character reveals exactly how long extrajudicial surveillance, torture, assassination and other black-ops activities should continue to his way of thinking. The camerawork didn't turn my stomach but damn, that line did. By this point in his fictional and cinematic life, Jason Bourne has earned himself a reputation, and it's fun to see him live up to it. When he's first spotted on a security camera, it's gratifying that the villain is justified in exclaiming, with no small amount of dread: "Jesus Christ, that's Jason Bourne." But the acts Bourne took to earn that renown were more satisfying than this experience. Greengrass' camera direction is a major detriment to the film, obscuring some otherwise enjoyable sequences masterminded as if by two chess players; but ultimately, what the camera belies just doesn't live up to the Bourne legacy. Couldn't disagree more. I haven't seen a trilogy end on a note this true and satisfying since The Lord of the Rings -- not a scene wasted, not a plot point unmet. The final 10 to 15 minutes, in which Bourne gets the answers he's been seeking, turn the entire project into a powerful statement about what we consent to, volunteer for and accept in the name of security, loyalty, courage or patriotism. I certainly haven't seen a more satisfying moment at the movies this summer -- go to The Bourne Ultimatum for the action and geekery, stay for the ethical agonies. Recommended without reservation -- and that's how this review ends. After all, Ken, if there's ANYTHING you should know from the movie, it's that the geek with the hands on the gears always gets the last word.